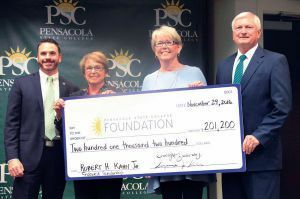 Pensacola State College received a $201,200 scholarship from the Robert H. Kahn Jr. Family Foundation on Tuesday. The gift, made in honor of the late Bobby Kahn Jr., was presented to Pensacola State President Ed Meadows during a 10:30 a.m. ceremony in the college’s District Board of Trustees board room in Building 7. A community leader, Kahn passed away in 2014. The gift created the Robert H. Kahn Jr. Endowed Scholarship in Business and Management at Pensacola State. The first scholarships have been awarded for the Spring 2017 semester and Dominique Massey-Johnson is one of four students to receive this award. Kahn’s wife, Suzanne Kahn, and daughter, Dorothy Kahn Galloway, established the scholarship to honor his interest in helping people achieve their dreams. Meadows applauded the Kahn family for honoring the college. “Suzanne Kahn and Dorothy Kahn Galloway have shown a strong commitment to Pensacola State College and our outstanding students. We are profoundly grateful for their fantastic support that will expand student scholarship opportunities,” he said. Kahn attended local schools, graduated from Pensacola High School in 1941, and attended Tulane University for two years until World War II interrupted his schooling. He enlisted in the U.S. Army in 1943 and served in the European Theater. He returned to Tulane to complete his degree in business administration, graduating in 1947. Kahn then entered the family business, the Lewis Bear Co., where he spent his career serving in various capacities including vice president, president and chairman of the board. He retired in 1985. He was a past president of Temple Beth-El and the Rotary Club of Pensacola. A member of Pensacola Yacht Club and an offshore sailor for more than 50 years, Kahn sailed the Pensacola-to-Mexico race seven times ─ winning it in 1975. Kahn also was a hunter and all-around outdoorsman. He taught Junior Achievement in local schools, and volunteered as a coach of the Junior NROTC rifle teams. A particular interest of his was interfaith relations. The Robert H. Kahn Jr. Family Foundation was established in 1998 with the mission of supporting arts and culture, education and religious activities. Pensacola State’s Business Department offers the Marjan Mazza Bachelor of Applied Science in Business and Management degree, which includes seven areas of concentration: Graphic Design Management, Health Care Management, Human Resources Management, Law Enforcement Administration, Organizational Administration, Project Management, and Public Safety Management; an Associate in Arts degree with advisement tracks in Business and Pre-Law/Pre-Legal Administration; Associate in Science degrees in Accounting Technology, Business Administration, Criminal Justice Technology, Cyber Forensics and Paralegal Studies; and multiple certificate programs. The various programs offered by the Business Department are designed to provide a foundation in business and prepare students to seek employment in a variety of business fields. 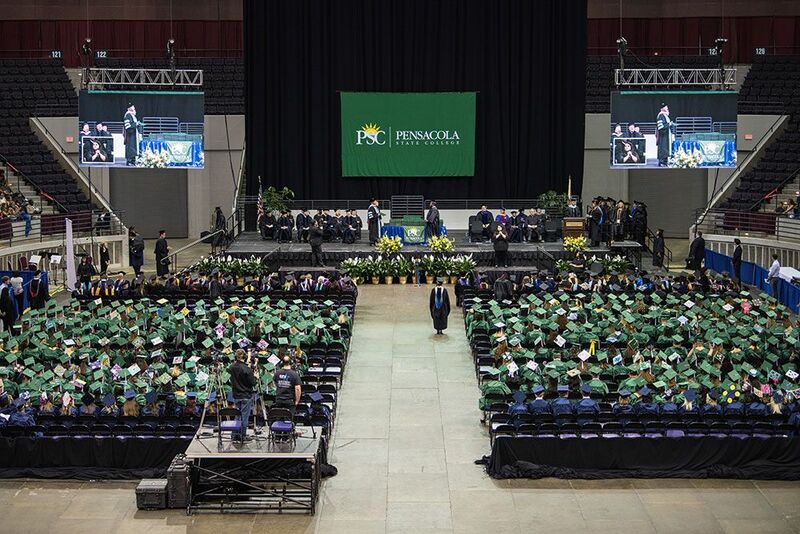 Whether students intend to continue their business education or plan to enter the business world after completing a degree at Pensacola State, the goal of the Business Department is to equip students with experience, ability, leadership, and professional qualifications to enhance advancement in the workplace.